Russel and student exploring tidepools. Wide ocean vistas, flowering meadows, and healthy marine resources are attractions of island life. Healthy ecosystems enhance our quality of life and draw visitors and new homeowners. But people can also affect island ecosystems and the unparalleled natural environment we enjoy today. As an islands-based scientific organization run by islanders — professional scientists, students, and volunteers — Kwiáht is uniquely situated to help islanders find a healthy balance between people, plants and wildlife. Kwiáht inventories and maps our living treasures from seabirds to salamanders, and from butterflies to bats. Our growing knowledge base depends on reports and specimens from islanders, young and old, as well as our own scientific studies. Read more about our Research. Help us preserve the living legacy of island wildlife and plants for future generations of islanders! 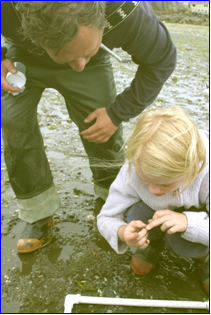 Consider a legacy gift to help us endow and sustain the San Juan Islands Marine Health Monitoring Network, the Camas Growers Network, Amphibian Watch, Bats & Barns, or apprenticeships in biochemistry, toxicology, and genetics for local youth. Kwiáht is a 501 (C) (3) nonprofit and a charity registered with the Washington Secretary of State. Donations are tax-deductible.